Materials: Iron, gold, silver, shibuichi , steel. 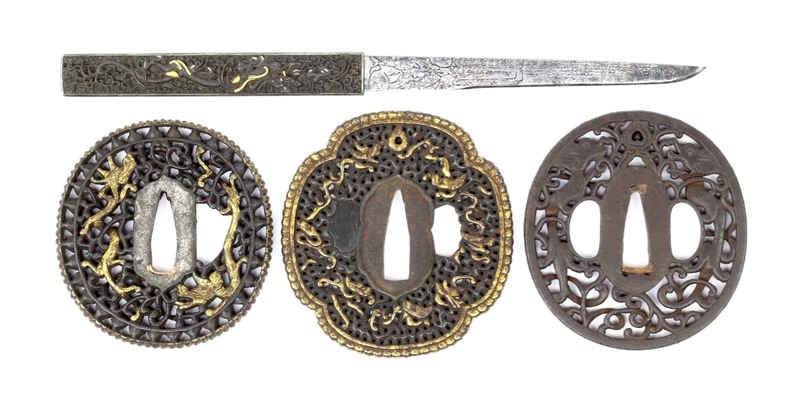 Japanese sword fittings that exhibit foreign influence are today commonly classified as nanban , "Southern barbarian" style. This is a catch-all classification that came to being only in the early 20th century. This is an over-simplification, because the genre can be split into items made in Japan, and those made outside of Japan. Those made in Japan could either be made by Japanese craftsmen, but there are also known examples that were made in Nagasaki Chinatown and attributed to Chinese, immigrant craftsmen. Those made outside of Japan typically came in two genres, one type that was manufactured with export to Japan in mind. The other type is a foreign guard, made according to local aesthetics, that somehow made it to Japan and got adjusted for use on a Japanese sword. Within the genre, you find mostly sword guards. 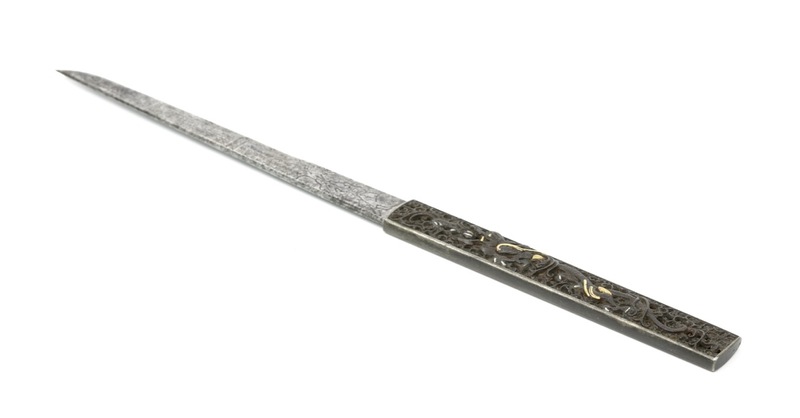 In fact, it is extremely rare to find anything in the "southern barbarian" style that is not a sword guard. 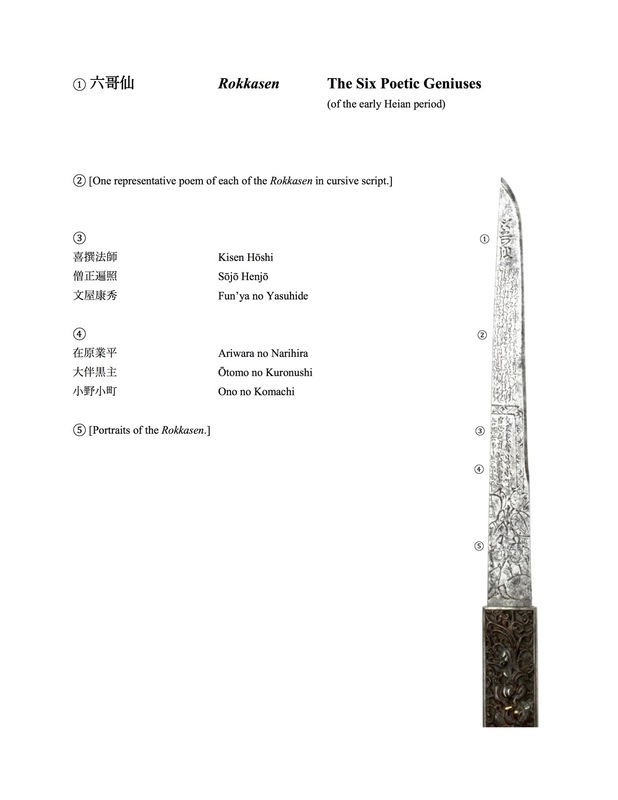 In this article I present you a very rare kogatana (小刀) or "little knife" with nanban kozuka (南蛮小柄) or "Southern barbarian small knife handle". These kogatana were utility knives that were carried in the scabbard alongside a Japanese sword. 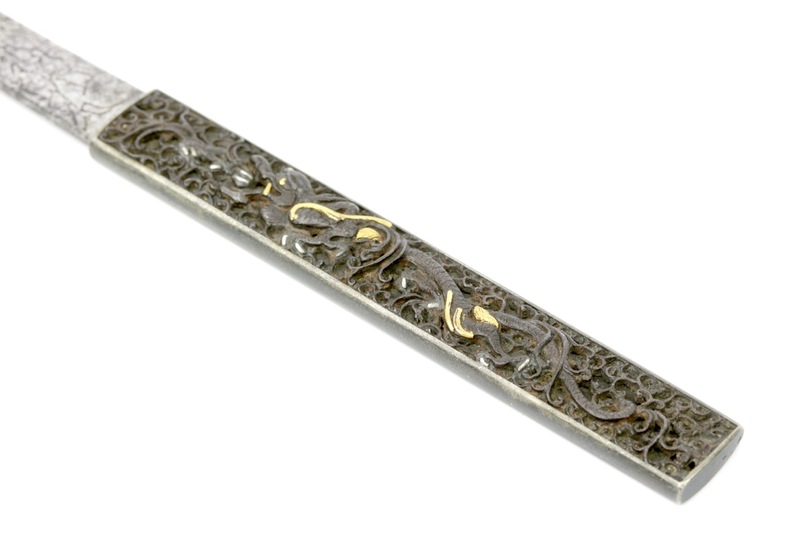 Its handle is made of shibuichi , a copper-silver alloy that was chemically treated to become this grayish-green. 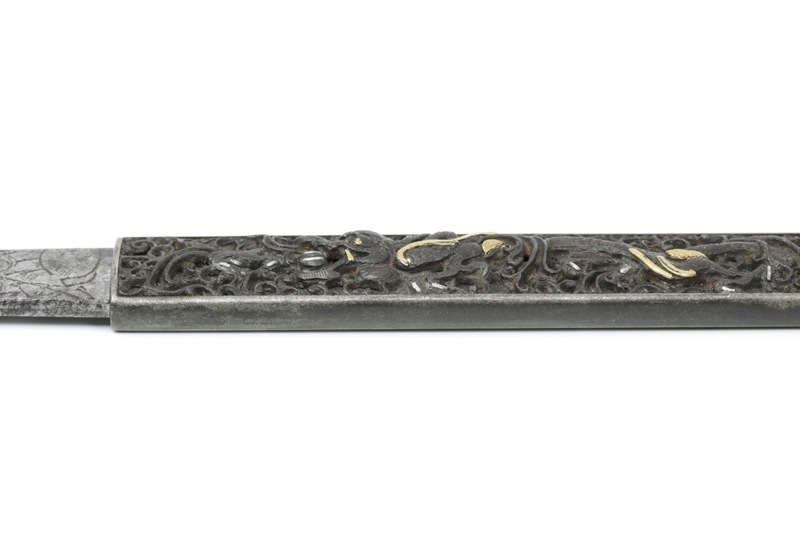 On the observe is a pierced iron panel that is framed within the handle. 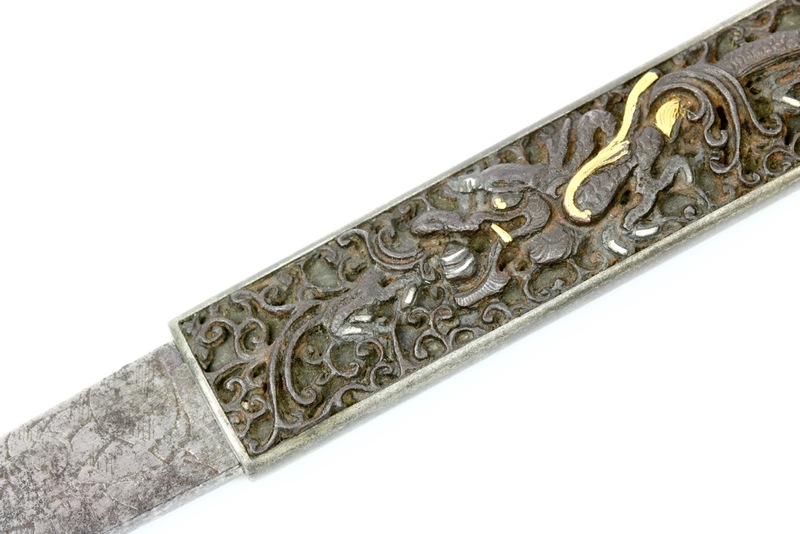 It is elaborately pierced and chiseled with a dragon chasing the sacred jewel ( tama ) among complex tendrils. Some details in the dragon's body and his eyes are highlighted in gold, while its nails and the jewel is highlighted in silver. 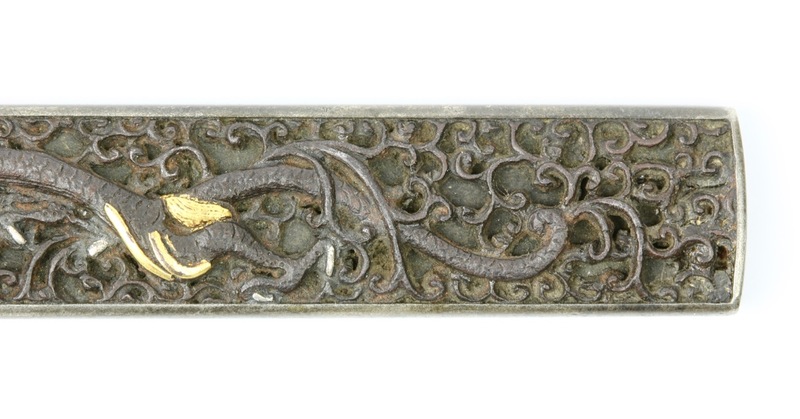 Dragon in openwork that chase the "sacred jewel" featured widely on Sino-Tibetan saddle plates and from there made their way to sword mountings of the elite of the Qing dynasty by the 17th century. Some of these guards were imported into Japan and got known as kwanto-gata or "Canton style". While the style is in fact more associated with the court in Beijing, it was probably through the port of Canton that these items were traded abroad. The kogatana shown with various nanban tsuba . The level of detail is far greater than what is mostly encountered within this genre. I tend to think the piece was most likely created by a Japanese craftsman working in or around Nagasaki. 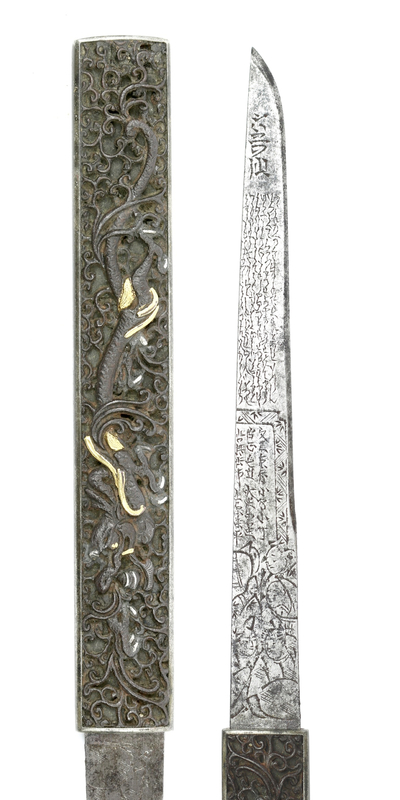 He was probably inspired by foreign sword mountings he had seen, yet worked in typical Japanese materials. The work exhibits the precision and meticulousness that Japan is famous for. A somewhat comparable piece in terms of materials was attributed to Yagami, a suburb of Nagasaki. 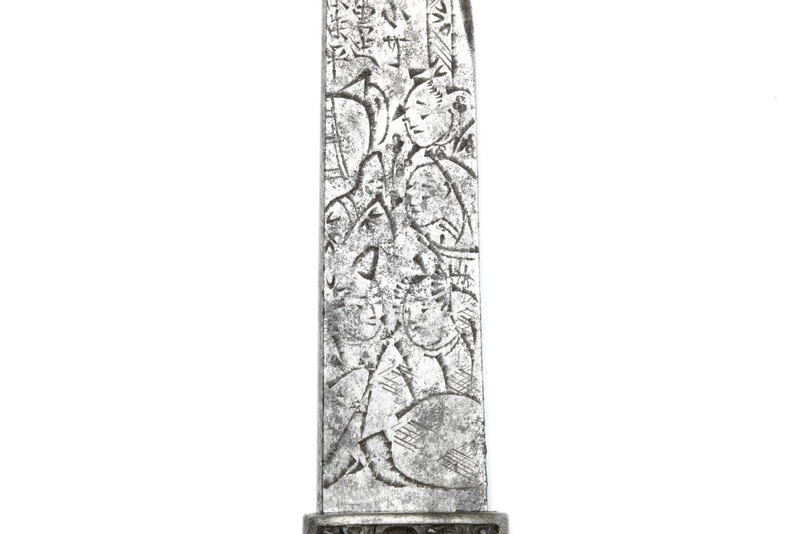 The blade, of typical form, is chiseled in great detail with the Rokkasen ( 六哥仙) or "Six Poetic Geniuses" of the 9th century. Translation provided by Markus Sesko. Our piece, shown laid on top of the Behrens collection catalog. 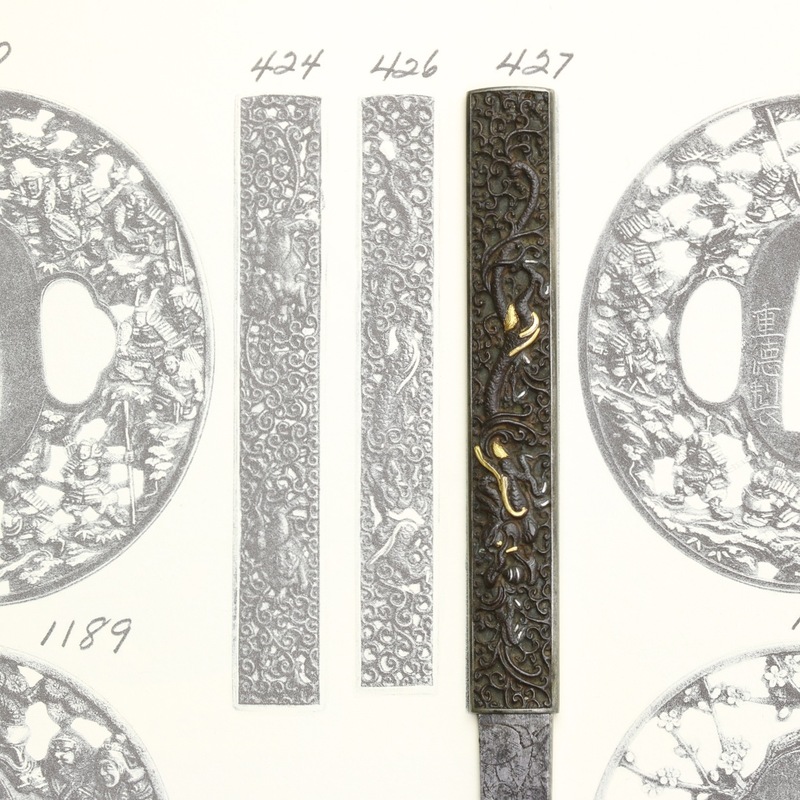 424 Iron, Namban style scrollwork and shishi at play. 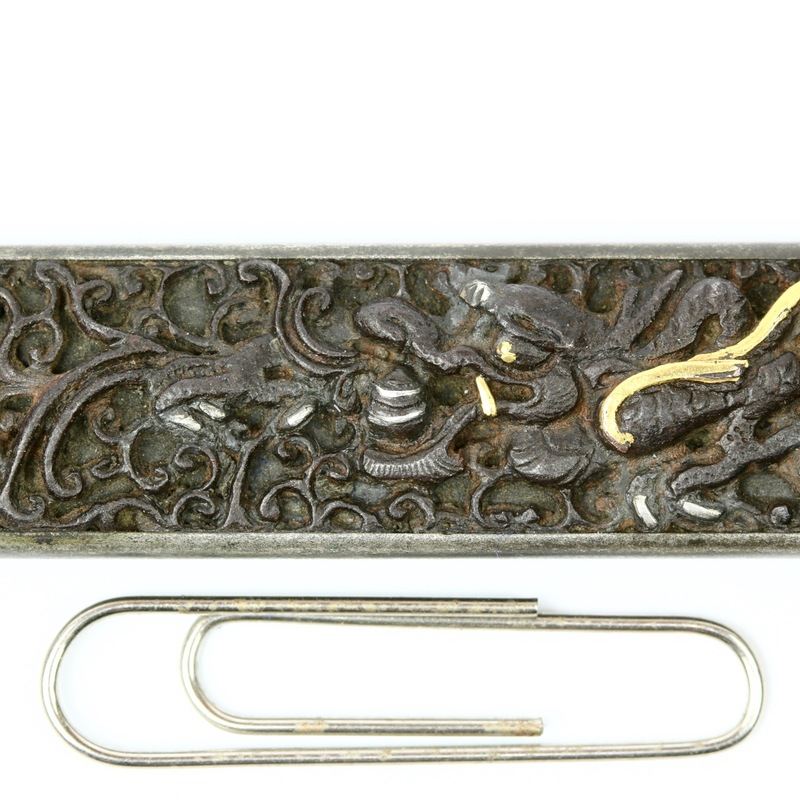 There is another similar piece, with a handle decorated with two playing shishi (Chinese guardian lion) just like #424 of the Behrens collection. 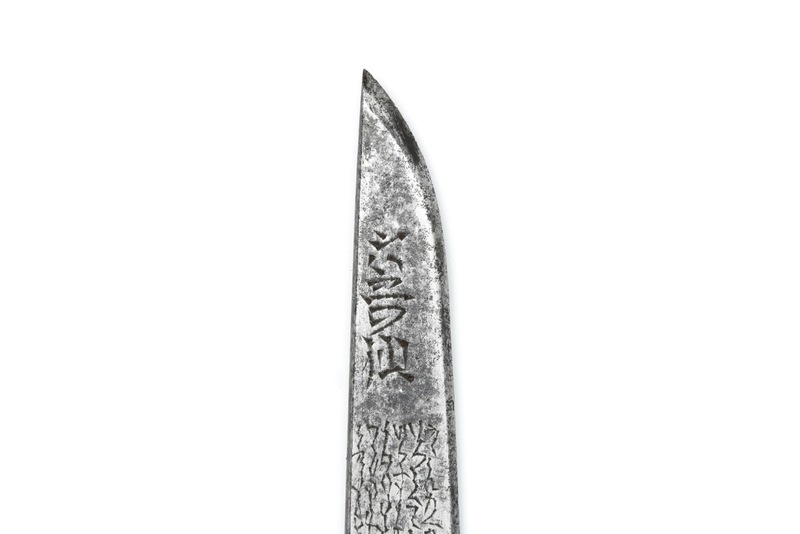 The kogatana in question sits in the scabbard of a Japanese aikuchi , a guardless mounting style of daggers. 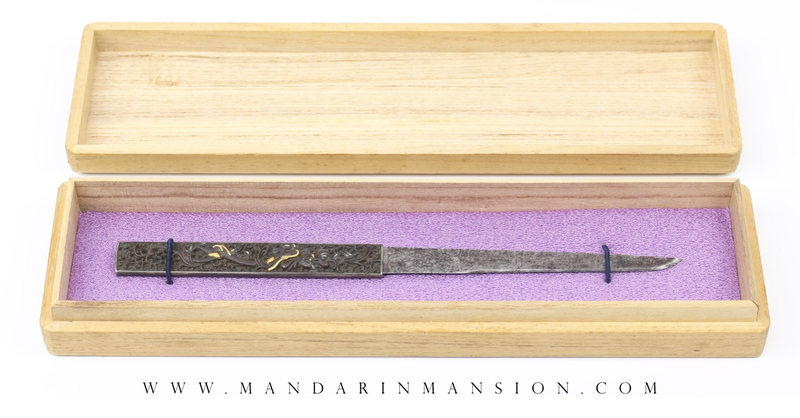 It has a blade made in Solingen, dated 1625, that was skilfully converted to Japanese dagger. 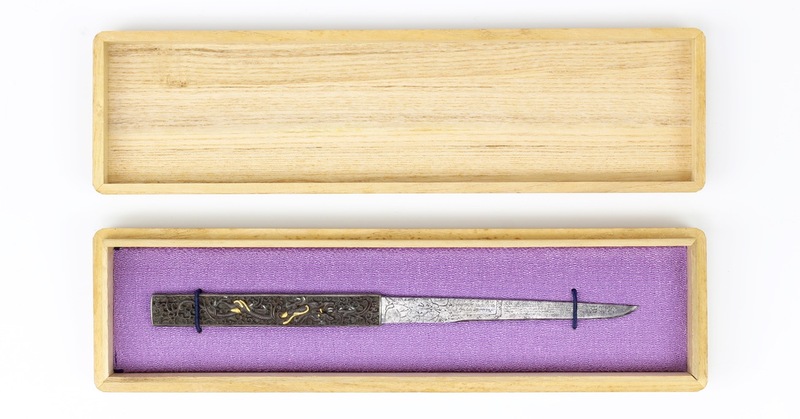 It is the only foreign blade known to have gotten this treatment by a Japanese smith. 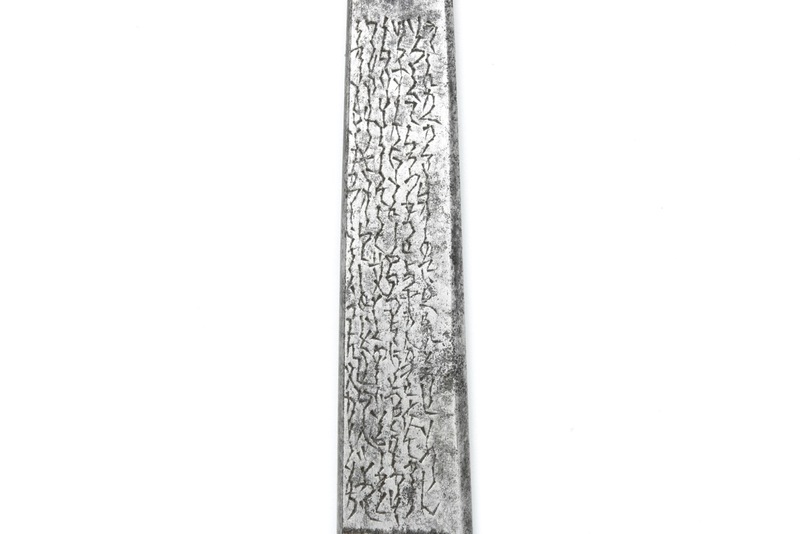 The original Solingen markings were left intact, presumably out of respect of the original maker. 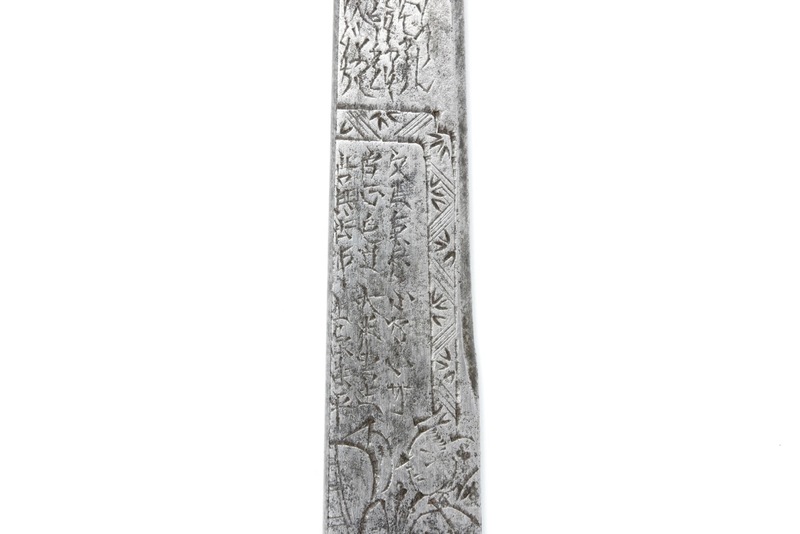 The scabbard is covered in Dutch leather, and carries the mon of the Matsura family. One wonders when it was put together in its current form. I suspect somewhere between the late 17th to late 18th century. A wonderfully detailed kogatana with a handle finely executed in the nanban style. 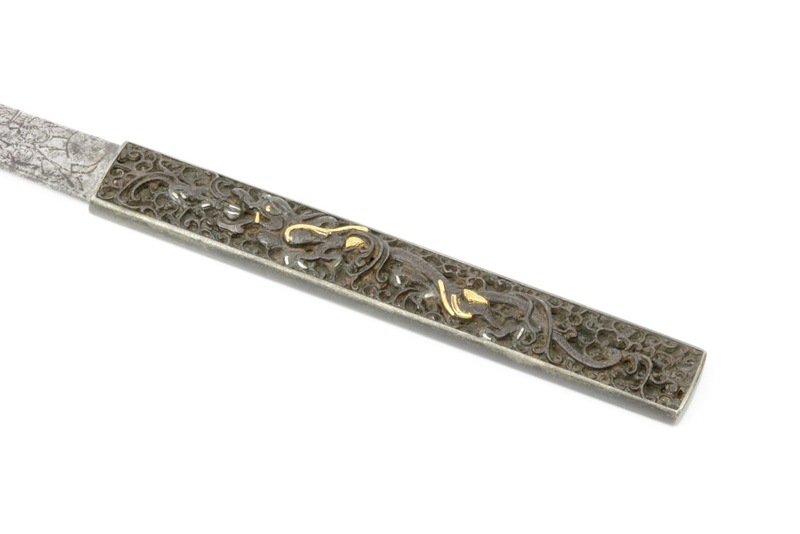 Few collections contain a kogatana or even a kozuka in this style, let alone one as fine as this one. It comes in a custom-made wooden storage box with on a cushioned purple background.